Background: Mustard oil, due to its high erucic acid content, should not be preferred as edible oil. Rather, fatty acids present in its triacylglycerol structure can be used in various fields. Structured lipids can also be formed from this oil and such compounds also have important applications, particularly in foods. Methods: Processes like hydrolysis can lead to production of free fatty acids. Alcoholysis can lead to biodiesel. Transesterification can result in concentration of erucic acid in alkyl fatty acid ester fraction and 18-carbon fatty acids in combination of acetylacyl and acylglycerol fraction. Biocatalyst like lipase (enzyme) is a better alternative to chemical catalyst regarding product quality, moderate process conditions and product selectivity. 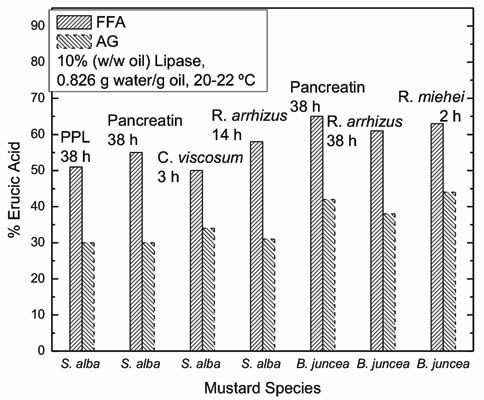 Results: Studies of various research groups on lipase catalyzed processes leading to modification of mustard oil have been presented in a concise form in this review. Process variables like water content, time and additives like surfactants, salts and organic solvents affected the aforesaid processes. Statistical optimization of hydrolysis in the presence of surfactants sufficiently enhanced erucic acid concentration in free fatty acid fraction. Conclusion: The studies represented in this review work give detailed idea on different kinds of possible applications of products derived from mustard oil. Type of lipase, process conditions and additives necessary for best outcome can also be identified for each process from this review work. Keywords: Mustard oil, lipase, hydrolysis, transesterification, alcoholysis, fatty acids. Keywords:Mustard oil, lipase, hydrolysis, transesterification, alcoholysis, fatty acids. Abstract:Background: Mustard oil, due to its high erucic acid content, should not be preferred as edible oil. Rather, fatty acids present in its triacylglycerol structure can be used in various fields. Structured lipids can also be formed from this oil and such compounds also have important applications, particularly in foods.